UC’s work is driven by volunteers and has done more with lesser donations. Our current work supports thousands in providing free Healthcare, which currently needs funding support. Please donate by card INR Donate or visit How to Donate page to get our Bank Account information for direct transfer. Please visit to Accounts to see UC’s accounts in a depth that is rarely available at a click of button. Visit About UC to know more. United Care Development Services, also know an UC( www.yousee.in ) was founded in June 2009. UC is a Philanthropy Exchange which provides a wider giving platform through the Four Donations For Development (Chaar Daan, Chaar Dhaam) initiative, which invites contributions in the form of 1.Volunteering(Shram Daan), 2.In Kind Donations(Vastu Daan), 3.Waste Donations (Kachra Daan) and 4.Financial(PostPay) Donations(Dhan Daan). UC’s objective is to generate Resources for Result oriented social work, in the areas of Education, Health and Environment. UC currently supports several Public Hospitals and a few NGOs working for these causes spread across India. The work at UC is almost entirely led by dedicated volunteers and undertaken in a very collaborative model with other Non-profit and Public Institutions. UC's goal is to support free Healthcare providers to be the most Caring and Cutting Edge Healthcare services providers, including Government and NonProfit Healthcare providers. Besides savings lives and improving quality of life for several lakhs of people, the services from these institutions help to secure their livelihoods from the extremely high cost care available from alternate providers. In the area of Critical Care, UC currently extends various volunteer service activities at the following Government Hospitals - Gandhi Hospital and Niloufer Hospitals in Hyderabad and Government General Hospital, Vijayawada, by providing a host of patient assistance and clinical support services. This has had a catalytic role in UC's efforts to mobilise and extend support for the overall Public Health area in Andhra Pradesh and Telangana states. 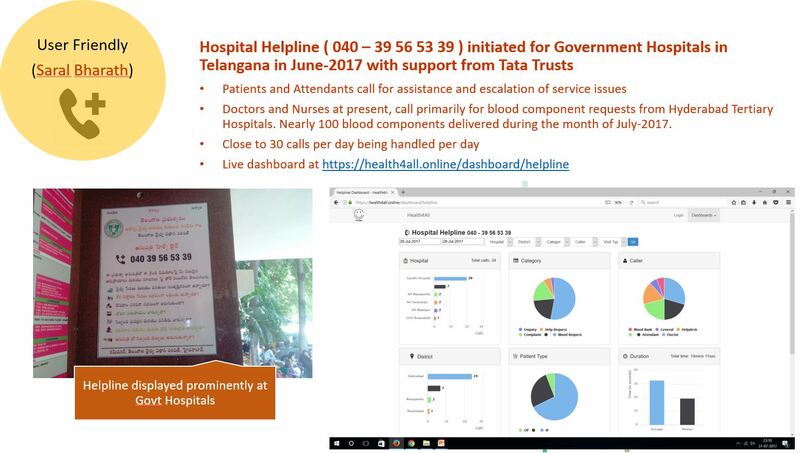 As of today, UC with support from Tata Trusts and other Individual and Institutional donors has provided Critical Care Nurses and Patient Assistance team members and several Biomedical Equipment, for improving Emergency and Critical Care Services at these 3 large Government hospitals in AP and Telangana. Through this initiative, everyday about 120 critical care patients are served and another 600 patients are served with internal transportation and help desk assistance. The work at Niloufer Hospital also includes a volunteer driven Child Heart Screening and Diagnosis support program which covers nearly 200 children every month, with the active support of Volunteer Cardiologists. With increasing Non-Communicable Disease (NCD) burden, the need for effective Palliative Care services is on the rise and the huge shortage of these services is glaring. UC is partnering and supporting the Pain Relief and Palliative Care Society(PRPCS) since June-2017, which is working to increase the availability of Palliative Care services in both in the Public Health system and outside of it. UC is currently supporting the palliative care services of PRPCS in Hyderabad which includes Hospice services and Palliative OP services at MNJ Cancer Hospital and Home Care services. In addition, UC with support from Tata Trusts in assisting PRPCS in setting up 31 palliative care centers in the Public Health system in all the districts of Telangana, which support 250 inpatients and 1500 home care patients at any point of time. 8 District Palliative Care Centers are operational currently in Telangana. Since Sep-2017, UC has also commenced monthly rural Health Camps outreach program to provide free Primary and Preventive Care health services for the rural populations, in collaboration with several volunteer Doctors, Panchayats, Primary Health Centers and local volunteer Organisations. Currently about 500 patients are served every month through these Rural Health camps. UC has also supported the Newborn Hearing Screening efforts of the Meenakshi Venkatraman Foundation, which today undertakes newborn hearing screening, with nearly 100 babies screened everyday and subsequent interventional support at the major public teaching hospitals in Hyderabad. Since 2017, UC has also commenced engagement with the Sri Sathya Sai Seva Organisations (SSSSO) to support the free healthcare services led by SSSSO. Besides being involved in a couple of Seva Projects with the Sri Sathya Sai Institute of Medical Sciences, Bengaluru, at its Skills Lab and Ophthalmology Department, UC has also supported in the setting up of SSSO-Odisha’s, Cardiac Outreach Center at Bhubaneswar and the SSSO-Kerala’s, Primary Healthcare Center at Aluva, Kochi, with support from the Tata Trusts. UC is also currently developing and implementing a mobile Healthcare Skills Lab (mHSL) program since April 2018 - for Community and Healthcare Providers, to deliver skills to the larger public and healthcare providers, so that they may be able to give improved nursing and nursing assistant support for patients at home and at hospital. 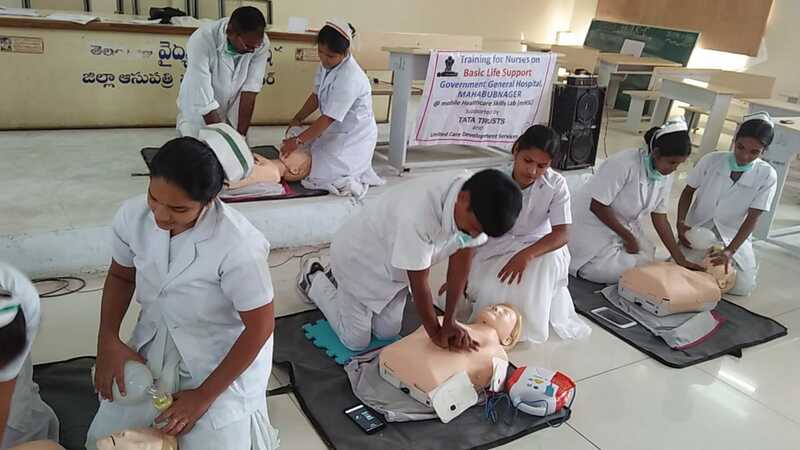 Everyday about 50 Patients attendants are trained in Nursing Assistant Skills at the Critical Care Units of Gandhi Hospital and MNJ Cancer Hospital Hyderabad and GGH Vijayawada. In addition, every month about 200 Nurses and other healthcare providers at Public Hospitals are also being trained in Basic Life Support and Nursing Skills using the mobile skill lab developed by UCDS. Equipment Bank: Rather than donating medical equipment to individual hospitals, UC has created a pool of medical equipment, a volunteer force of free service biomedical equipment, made available where and when needed, adopting principles of Just-in-time and low inventory. Commenced in Aug-2016 and serving 8 hospitals currently and also the free health camps. UC is working with Pragathi Welfare Society to supplement resources at Government High School and Primary Schools at Burugula Village. UC has also been working with Residential and Office communities in Hyderabad to encourage source segregation of waste and efficient recycling of such waste. Value generated from some of the recycling activity is contributed to some of the social work projects coordinated by UC. UC has also continued to play the role of facilitating greater collaboration between non-profit organisations and the larger public, through the annual SevaMela event conducted in the first week of October, coinciding with the Joy of Giving Week (Daan Utsav) celebrations held across the country. UC has constantly invested in its credo “YouSee”, enabling transparency, openness and collaboration. In that direction, since July-2017, UC’s entire accounts, including payments, receipts, ledgers,TB, bills and invoices, are all open for the public at our site www.yousee.in/accounts , another product of UC’s work in developing open source IT solutions by dedicated volunteers.